Emotionally driven,lyrically rich, rootsy alterna-country and new folk. This is Bobby's debut album, and the one that most show his country roots. In 1999, "Hope's Cafe" received a warm welcome at Americana radio in the US and abroad. This album could best be described as rootsy/alterna-country. Bobby is a sixth-generation musician. He began performing at age 7 in his father’s band, and left at 17 to pursue his widening musical interests. As a performer, Bobby has shared the bill with some of the top country and folk artists, including Vince Gill, Bill Staines, Bill Morrissey, Deana Carter, Bryan White, Pete Seeger, Arlo Guthrie, The Neilds, and Jess Klein. As a sought-after lead guitarist he has shared the stage with George Jones, Asleep at the Wheel, Willie Nelson, The Bellamy Brothers, Waylon Jennings, and many others. The words hit home with a feeling of remembering... he sings ME. I seldon listen to anything even remotely 'country' but this is a different CD. The way that Bobby Sweet plays and the way he puts together words and images I feel that he is sharing more than just a song...he is sharing a past, a feeling, a want and a love of life. Bobby sings in a way that makes you feel that you know him. He stirs memories and puts salve on hurts. I await his new CD and know that the voice and the music will brighten my day. Especialy enjoyed track 5, "What I Did Then." Simply put, Bobby Sweet's first solo album is a gem. Bobby hails from the talent-rich Berkshire Region of Western Massachusetts, and represents the cream of the crop. 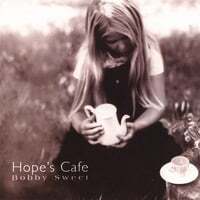 The songs on "Hope's Cafe" are SOLID—catchy, hum-along singer-songwriter/contemporary country tunes with heartfelt lyrics and absolutely Top-Shelf production value. This disc will stand up to anything you put alongside it. I'm proud to even live four towns away from this guy, and can't wait to hear the next one—"Already Home".